Bu çalışmanın başlıca amacı, 1988-2015 yılları avokado üretim FAOSTAT verilerini kullanarak 2016-2025 dönemi için Türkiye’deki avokado üretimini modellemektir. 1988-2015 dönemi avokado üretimine ait zaman serisi verilerinin durağan olmadıgı belirlenmiştir. Durağanlık, zaman serilerinin ilk derece farkının alınmasıyla sağlanmıştır. Avokado üretimini tahminlemede üç üstel düzleştirme (Holt, Brown ve Damped) yöntemi kıyaslanmıştır. Brown üstsel düzleştirme modeli, avokado üretimini tahminlemede en uygun yöntem olarak tanımlanmıştır. Türkiye’deki avokado üretiminin 2016-2025 dönemi için 2004 tondan 3156 tona yükseleceği tespit edilmiştir. Bu araştırmadan elde edilen sonuçların, Türkiye’de gıda güvenliği için makro seviyede politikaların geliştirilmesine ve avokado üretiminin gelecekte daha iyi bir şekilde planlanmasına yardımcı olacağı düşünülmektedir. The main aim of this study was to model avocado production in Turkey for 2016-2025 period using 1988-2015 years FAOSTAT data. Avocado production time series data for the 1988-2015 period was found non-stationary. Stationarity was obtained after taking the first difference of the time series. Three Exponential Smoothing (Holt, Brown and Damped) methods were compared to model avocado production. Brown exponential smoothing model was the most appropriate forecasting model for avocado production. We forecasted that the avocado production in Turkey will show increase from 2004 tons to 3156 tons for the 2016-2025 period. The results of this study could help policy makers to develop macro-level policies for food safety and more powerful strategies for better planning avocado production in Turkey for the future. Armutlu, I. (2008). Isletmelerde Uygulamali Istatistik Sayisal Yontemler-1.2. Baski, Alfa Yayınlari; Istanbul. Badmus, M.A., & Ariyo, O.S. (2011). Forecasting Cultivated Areas and Production of Maize in Nigeria Using ARIMA model. Asian Journal of Agricultural Sciences. 3(3): 171- 176. Borkar, P. (2016). Modeling of Groundnut Production in India Using ARIMA Model. International Journal of Research in IT& Management. 6(3): 36-43. Calderon Oliver, Mariel., Escalona Buendía, Hector B., Medına Campos, Omar N., Pedraza Chaverrı, Jose., Pedroza Islas, Ruth., Ponce Alquıcıra, Edith (2016). Optimization of the Antioxidant and Antimicrobial Response of the Combined Effect of Nisin and Avocado Byproducts. Food Science and Technology. 65:46-52. Celik, S. 2013. Modelling of production amount of nuts fruit by using Box-Jenkins technique. Yuzuncu Yil J. Agr. Sci. 23(1):18-30. Celik, S. Karadas, K. Eyduran, E. 2017. Forecasting Groundnut Production of Turkey Via Arima Models. The Journal of Animal and Plant Science. FAOSTAT (2017). Statistical Database of the Food and Agriculture Organization of the United Nations. http://faostat.fao.org/. Gardner, Jr., E.S. and E. Mckenzie (1985). Forecasting Trends in Time series. Manage. Sci. 31: 1237–1246. Hamjah M A. 2014. Forecasting Major Fruit Crops Productions in Bangladesh Using Box-Jenkins ARIMA Model. Journal of Economics and Sustainable Development 5(7): 137-142. Hanke, J.E. and D.W. Wichern (2008). Business Forecasting. 8thEdition, Pearson Education International; Harlow, Essex. Kadilar, C. (2009). SPSS Uygulamali Zaman Serileri Analizine Giris, Bizim Buro Basimevi; Ankara. Karadas, K. Celik, S. Eyduran, E. Hopoglu, S. 2017a. Forecasting Production Of Some Oil Seed Crops In Turkey Using Exponential Smoothing Methods. The Journal of Animal and Plant Science (in press). Karadas, K. Celik, S. Hopoglu, S. Eyduran, E. Iqbal, F. 2017b. A Survey of the Relationship Between Production Amount, Cultivation Area and Yield of Cotton Lint in Turkey Using Time Series Analysis. The Journal of Animal and Plant Science (in press). Kumar, M. & Anand, M. (2014). An Application of Time Series ARIMA Forecasting Model for Predicting Sugarcane Production in India. Studies in Business and Economics, 9(1), 81-94. Makridakis, S, S.C. Wheelwright, and R.J. Hyndman (1988). Forecasting: Methods and Applications, Third Edition. John Wiley and Sons; New York. Masuda, T, and P.D. Goldsmith (2009). World Soybean Production: Area Harvested, Yield, and Long-term Projections. International Food and Agribusiness Management Association. 12(4): 143-161. Orhunbilge, N. (1999). Zaman Serileri Analizi Tahmin ve Fiyat Endeksleri, Avciol. Basim Yayin; Istanbul. Pektas, A. (2013). SPSS Ile Veri Madenciligi. Dikey eksen Yayın Dagitim, Yazilim ve Egitim Hizmetleri San. ve Tic. Ltd. Sti. ; Istanbul. Sbrana, G. (2012). Damped Trend Exponential Smoothing: Prediction and Control. Journal of Quantitative Economics. 10 (2): 152-192. Semerci, A. and S.Ozer (2011). Turkiye’de Aycicegi Ekim Alanı, Üretim Miktarı ve Verim Değerinde Olası Değişimler. 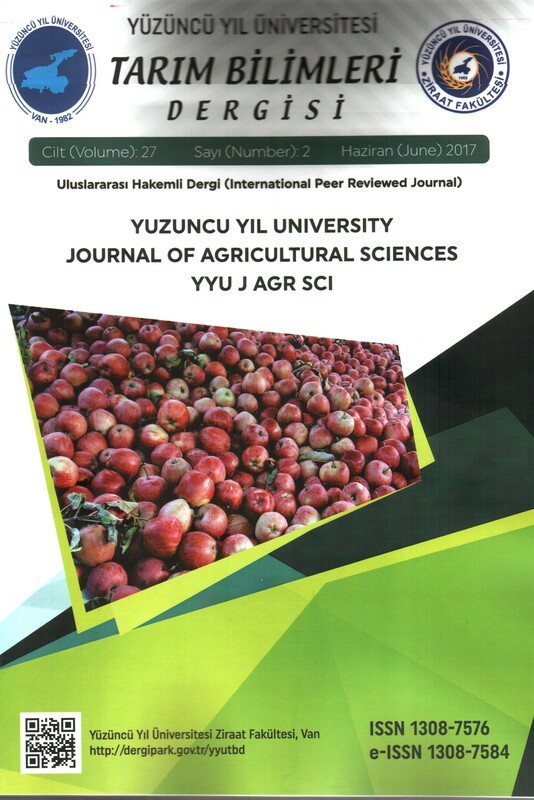 Journal of Tekirdag Agricultural Faculty. 8(3): 46-52. Sharpe, R., R. De Vaux and P.F. Velleman (2010). Business Statistics, 2nd Edition, Addison Vesley - Pearson Education; Boston. Suresh, K., R. Kiran, K.Giridhar and K.Sampath (2012). Modelling and Forecasting Livestock Feed Resources in India Using Climate Variables. Asian-Australasian Journal of Animal Science, 25(4): 462-470. Yaffee, R. and M. McGee, (2000). Introduction to Time Series Analysis and Forecasting with Applications of SAS and SPSS, Academic Press; San Diego. Zhang, Z.; Huber, D.J. ; Rao J (2013). Antioxidant Systems of Ripening Avocado (Persea americana Mill.) Fruit Following Treatment at the Preclimacteric Stage with Aqueous 1-methylcyclopropene. Postharvest Biology and Technology, 76, 58-64.